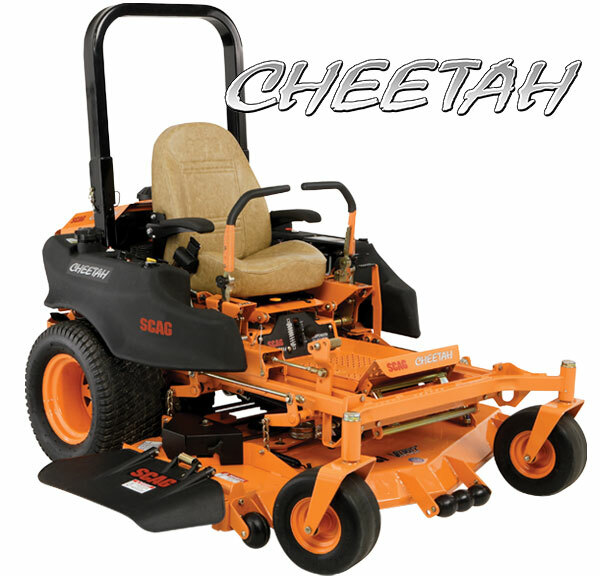 The Cheetah accelerates productivity with double-digit mowing speeds that cut time and labor. The new Operator Suspension System makes the Cheetah the most comfortable mower you have ever ridden. If speed and comfort aren’t enough, the Velocity Plus cutter deck puts the Cheetah laps ahead of the field. The entire operator platform is uniquely suspended to minimize the effects of rough terrain for all-day comfort. The Operator Suspension System has only three moving parts, including the adjustable coil-over shock. You can select from five different suspension settings to customize the ride quality to match your preferences. The seat is rubber iso-mounted at four points for further vibration reduction. With a shift-on-the-fly speed selector, the Cheetah runs at two speeds: low-range, up to 12 miles per hour, and high-range, up to 16 miles per hour. Quality-of-cut is assured with a 61-inch Velocity Plus cutter deck, the deck all others strive to be. • Operator Suspension System isolates the entire operator station from the effects of rough terrain. A coil-over shock provides effective suspension action right where it’s needed, and only where it’s needed for a smooth ride. Adjust the suspension system from firm to soft with a selection of five settings to match your personal preference. this suspension system has no negative effect on the quality-of-cut. • The comfortable contoured seat also features rubber iso-mounting at four points to absorb vibration and increase comfort. • Two-speed selector lets you choose either low-range to mow up to 12 mph or high range for up to 16 mph. • Adjust the height-of-cut in seconds from 1 1/4” to 5” right from the seat with the improved vertical facing, foot operated cutting height adjustment with convenient, adjustable three-position foot pedal. • Compact fold-away ROPS for easy transport and storage. Internal anti-rattle clips reduce noise and spring-loaded pins keep the ROPS firmly locked when in the raised position. • Quick-Fit steering control levers and a spacious footplate make the Cheetah comfortable to operate and reduce fatigue. • Extra-low center-of-gravity gives the Cheetah sure-footed stability on a wide variety of terrains. • Tri-Plate Velocity Plus cutter deck provides the finest cut you can get; deck tops that are nearly 1/2” thick make them the strongest decks in the industry. • Double-tube mainframe make the Cheetah tough, durable and dependable year after year. • A 29 horsepower Kohler EFI engine delivers plenty of power. • Dual tanks provide 15-gallon fuel capacity to keep you mowing for hours for better productivity. • Dual ZT-5400 integrated Hydro-Gear transaxles give you responsive, dependable power; a cooling fan on each unit keeps operating temperatures low. • Large-capacity hydro system increases hydraulic component efficiency and extends system life. • Heavy-duty Ogura GT3.5 clutch provides 250 ft/lbs of holding strength and features an adjustable air-gap for long service life. • Covered by a strong 2-year commercial or 3-year non-commercial mower warranty. See the Scag Limited Warranty Statement for complete details.